Killer Elite is saddled with a vague and forgettable title but at least it sounds more lethal than “The Feather Men,” the book it is based upon written by Sir Ranulph Fiennes (face it, an evil cabal known as the Feather Men does not inspire too much fear). These ex-SAS (Special Air Service) members, and now business leaders, chose the name themselves to signify their light touch on situations which concern them. So when shady characters start asking around about an old mission in Oman which involved SAS men, this falls right in the wheelhouse of issues the Feather Men are watching out for. “The Feather Men” novel is allegedly based on a true story but none of the facts have ever been verified. Sir Fiennes described the book as “factional” which does not bode well for the story’s authenticity. However, the plot is intriguing, especially for a shoot ’em up first, ask questions later action fest. The background and set up are complicated enough which makes you want to follow it closely. I do not want to provide an exact plot synopsis, but essentially Danny Bryce (Jason Statham) must kill some ex-SAS men to save his assassin mentor, Hunter (Robert De Niro), from some Omani oil sheiks. Spike Logan (Clive Owen), also an ex-SAS man, but not one of the marked men, has his sixth sense kick into overdrive and tries to save his mates from Danny’s bullets as any good Feather Man would. Sir Fiennes actually claims to be one of those marked SAS men. The script portrays Danny as an assassin who has lost his taste for killing and vows after every trigger pull that “this is my last job.” He is supposedly from Australia but oddly maintains a thick and native British accent. Since every assassin must have someone to come home to, his girlfriend Anne (Yvonne Strahovski) waits impatiently for him as he disappears on his missions. Strahovski is a real life Australian and has a matching accent to prove it. She has been outstanding in the “Chuck” television series so it is enjoyable to see her finally cross over into mainstream film. First time feature film director Gary McKendry is very good at filming one on one hand fighting scenes. Statham and Owen impressively use the entire room and every prop in it to beat each other senseless. For the ladies, they still keep their film star looks even after they are done taking turns butchering each other. What McKendry has yet to master are car chases. The edits are too fast which turns each of them into a messy muddle. Opening one weekend after “Drive” which contains outstanding car sequences makes these awkward scenes in Killer Elite look even worse by comparison. 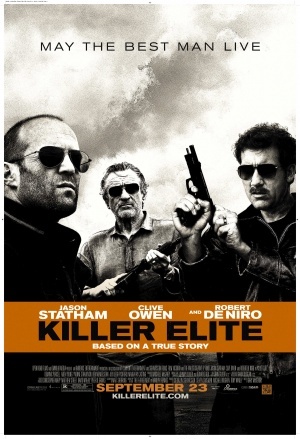 The overall look to Killer Elite is good, however. Even though it was mainly shot in Melbourne, the skies are usually England gray and the Brecon Beacons mountain range sequence is shot well. This film is right in that middle range where I am unsure still at this point rather to recommend it or not. It is much better than the garbage in its genre such as “The Expendables” but fails to reach up to the higher level of Statham actioners like “Crank” or “The Bank Job.” I marginally recommend Killer Elite for its absorbing plot and intricate assassination sequences, but be warned, this film is not anything more than average.